The reasons Shakespeare is still relevant are to expose students to how English is different than today’s English, at least this is what is said in “Why study Shakespeare Today?” My reaction to what was said in the video is that I can understand that studying Shakespeare gives us students the exposure to old English and to see how English was different in Shakespeare’s time and compare it to English now-a-days. My reactions to what was said were that I was surprised because if you think about it, it’s not easy make up words and if you make up words it’s also a challenge to have people use the words you made up without looking at you as if you were crazy, but what can I say? 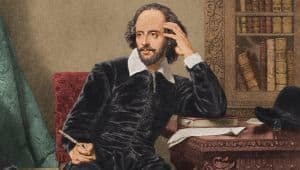 Shakespeare made up 1700 words. The play I am studying at the moment is Othello. My strategies to approaching this play are re-reading and really going through and breaking down paragraphs that stand out from the others and label important details throughout the play. My confidence with working with the language in the play is that it was a bit hard to understand, at first a bit difficult, but soon I get the hang of it as does everyone else who reads Othello. Othello Getting Owned by Roberto is licensed under a Creative Commons Attribution-ShareAlike 4.0 International License.